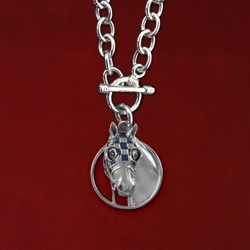 This sterling silver 18′ toggle necklace ends with the Secretariat charm and hand enameled blue blinkers.The charm is regular size measuring 3/4′ wide and 7/8″ high. New! 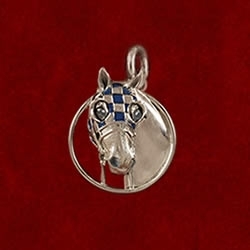 This sterling silver 18′ toggle necklace ends with the Secretariat charm and hand enameled blue blinkers.The charm is regular size measuring 3/4′ wide and 7/8″ high. 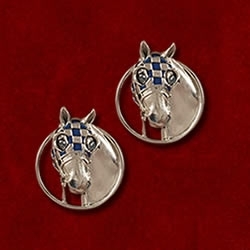 Great look with the enamel post earrings. 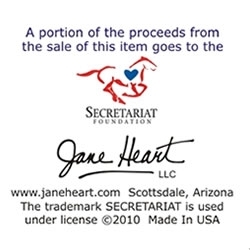 A portion of the proceeds benefits the Secretariat Foundation. 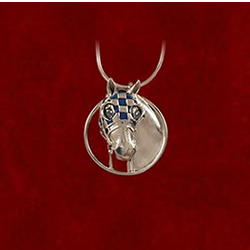 Arrives in a gift box with commemorative card. 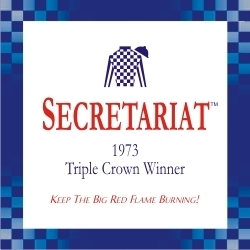 The name SECRETARIAT is used under license. Click on Press above to read more about this special design. Additional lengths available at small additional cost.